I was immediately drawn to this book by its title; there are so few helpful books on product management for the high-tech industry. I read a huge amount around the subject not only in order to keep myself up to date, but also to offer my clients pointers to books that they might find helpful, so I was happy to read it for review. In it, Steinhardt sets out to provide ‘a consistent and holistic managerial approach to product management’. He points out, quite rightly, that every technology company seems to have a different definition of what Product Management means. He defines the role as covering both the product planning activities of figuring out what a product should be, but also the product marketing ones of presenting its benefits to the customer. He puts those two roles alongside the roles of Sales Engineer (often called product specialist, evangelist, pre-sales support, etc) and MarCom Manager. He then defines the Product Definition Team as the Product Planner (one half of his Product Manager, representing the market) with the Product Architect (the product expert devising the features) and Product Developer (the technology expert figuring out the specifications). Steinhardt clearly has plenty of experience with software start-ups because he accepts that these roles are often shared. What tripped me up was that the design of the product was not mentioned, but it seemed to me that it was assumed that the engineering team would successfully translate a good requirements document into a good product. ‘The product architect’s job is to devise a functional solution to the market problem according to the market requirements…’ he writes, I suspect he considers design to be a purely technical activity and in fact does not even list it as a ‘product quality’ later in the book. A shame when the most successful technology company today, Apple, has put design at the centre of their product strategy. Having usefully defined the different roles he then moves into the process. He is very clear about the importance of being ‘market driven’ rather than ‘sales’ or ‘technology’ driven as a company, so I expected a lot from Chapter 4, ‘Crafting Market Requirements’. In fact, Voice of the Customer (VOC) gets just six sentences. He does say that this is all about eliciting needs, but then goes on to say ‘The VOC process is based on in-depth interviews that lead interviewees through a series of situations in which they have experienced, and perhaps found, solutions to the market problem being investigated’. What problem, and which interviewees? In my experience, VOC is the vital step in figuring out what the problem is. No mention either that this problem might be one that the customer does not even recognise that they have (and may not do until they are offered the solution). Oh, and did we forget to figure out who we should talk to as a customer? There is a lot of important detail there that has been skipped. The rest of the chapter focuses on defining the requirements and Steinhardt gives clear advice on how to structure those requirements and make them unambiguous. He divides them into Directives, Constraints, Rationales and Sources and gives examples of what these are. He also raises the idea of using a database to capture market requirements. I’m sure this is a good idea, it is the only way to keep track of everything and to be able to use the same sources as rationale for different features, and yet be able to trace back to them from the product requirements. Steinhardt then moves onto marketing. He talks about three principal methods for marketing to achieve product awareness, differentiation and demand: price competition, comparative marketing and value marketing (focussing on the value to the customer). I normally think of these as just three elements within the marketing mix. He devotes the next chapter to value marketing and becomes very wrapped up in how the customer perceives product value before and after the buying decision. I became rather concerned at this point that he was proposing that the customer could evaluate everything about the product into a value. ‘After purchasing the product, through use and ongoing tracking, the customer can independently and empirically measure the product’s actual value’. Can they? What about intangible qualities like design or influences such as peer pressure or framing? Maybe this is how Mr Steinhardt buys things, but I’m pretty sure many people don’t. He does admit: ‘humans are considered emotional and irrational by their own fabric’. The chapter on product life-cycle is more helpful with examples of different strategies, but sadly no mention of the work of Christensen (Disruption) or Moore (Chasm). I feel that Steinhardt has erred too far towards definition and process and too far away from how to imagine, design and build successful high-tech products. What of beautiful products, delightful products, what of the user experience? At times, I felt that he was trying to wrestle a pesky creative process into submission with “domains”, “methods”, “goals”, “modes”, and, I felt, more than anything else “discipline”. All of this methodology is wrapped up in Steinhardt’s Blackblot Product Manager’s Toolkit, and the majority of the 378 pages are dedicated to templates of that toolkit. If you need to look through templates for all the different documents that Product Managers have to produce, these might be useful, though they are not provided electronically and that appears to cost $99 from his website. Of the rest of the book there are 76 pages of descriptive content (with some obscure English such as “presentment” and “criterial”), a 9 page glossary, 24 pages of models, and no index. It costs $60. At that price I think the customer could expect both a fuller account of the process and electronic copies of the tools and templates. 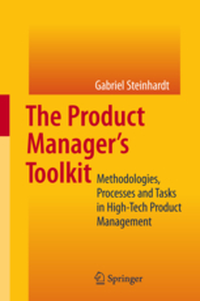 Thank you for the well-written book review and for your comments regarding the “Product Manager’s Toolkit: Methodologies, Processes and Tasks in High-Tech Product Management” book, a practical primer for implementing efficient product management practices. The book review highlights and questions several topics. Below are Blackblot’s clarifications to the main topics and general feedback. The “Product Manager’s Toolkit” book does not relate to the task of product design because it is not the responsibility of any role in the product management domain and never was. Product design resides in the solution space (designing and building a product) while the product management domain resides in the problem space (identifying and articulating market problems, from a product planning perspective). Product design is entrusted to User Interface Experts who are a distinct role in the User Experience function. This is an established practice in high-tech companies. For example, separating user experience and product management is notably displayed in the Microsoft Solutions Framework (MSF) team model, a part of a collection of best practices for delivering technology products which was first introduced in 1993 by Microsoft. The fundamentals of the Voice of the Customer (VOC) process intentionally receive concise coverage in the “Product Manager’s Toolkit” book. This is because the “Product Manager’s Toolkit” book is declaratively focused on presenting a product management methodology while executing the VOC process is a peripheral technique, one of many techniques (e.g., product demos), that is used in product management. A good source of information on the technique of executing the VOC process is Ms. Sheila Mello’s book, “Customer-Centric Product Definition – The Key to Great Product Development”. Product value is an abstract concept. There are ways to intuitively and mathematically calculate the value of a product’s tangible and intangible assets in either monetary or non-monetary terms. This is similar to the business practice of monetizing a product’s or a company’s brand equity. All customers can calculate product value and do so before and after purchase, yet may do so in variably different ways. The “Product Manager’s Toolkit” book addresses the matter of practically applying the concept of product value in product management. More theoretical information on the concept of product value can be found in the early works of Prof. Richard Thaler from the University of Chicago’s graduate school of business. The PMTK templates which represent a critical part of the “Product Manager’s Toolkit” book and a crux in Blackblot’s product management methodology were first introduced in 2004 and are used worldwide by over 3,000 registered users. The book review woefully lacks any reference or mention to any PMTK template and consequently does not comment on the PMTK templates’ structure, content nor on their usefulness to product management professionals. Finally, the book review solidly focuses on several details and regrettably does not reflect upon the broad strategic aspects and the higher-level contribution of the “Product Manager’s Toolkit” book’s methodology and templates to the product management profession. This entry was posted in book review and tagged Book review, lifecycle, product management, theory. Bookmark the permalink. Thanks for providing an overview of the product manager’s toolkit. It was helpful. Hi, sure you can quote it, be my guest. The 7 page references above – e.g. Ch3, page 25 — seem to point to files on the local file system. Can you post those pages to an accessible web address? Thanks Saeed, it is a Word to WordPress error, the links are just supposed to point to the footnotes, no further files. The footnotes are simply references to the pages in the book. I’ll fix the html as soon as possible. Interesting review and response… I definitely agree with the view that every company seems to set up product management in a slightly different way – in our experience job titles are not very helpful in understanding what someone does. Somewhere in every business that sells products all these activities should be going on and one of the first steps you need to be clear on as a product manager is what you’re responsible for, what others do and if there are any gaps. I think that breaking up the role like that helps a lot with focussing the mind on what you should be paying attention to at each stage. Having said that, there is a natural continuum. If you get that strategic bit right, it informs the inbound work and that can then make the outbound work a breeze. Get it wrong, or have the process too disjointed and the whole thing ends up in a useless heap! Thanks for the recommendation. It will be interesting to see how this could influence others.